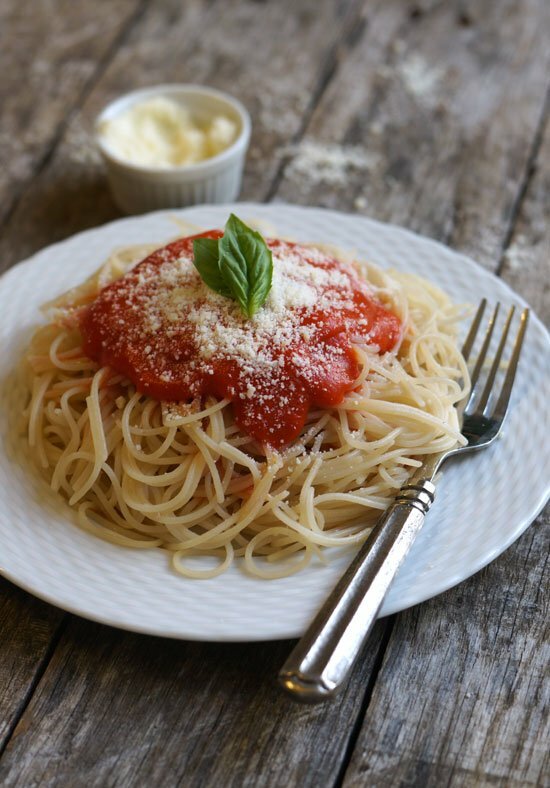 With nightshades becoming a more common food sensitivity these days, many might find themselves looking for an alternative to their favorite tomato-based condiments and sauces, like this marinara sauce. If you’re not familiar with nightshades, they are a family of plants that contain certain compounds, like lectins and saponins, that can make them problematic, particularly for those dealing with autoimmune disease. These plants include tomatoes, bell peppers, hot peppers, paprika, goji berries, eggplant, and potatoes, among others. (For a complete list, see this post by The Paleo Mom.) A growing number of people seem to be trying out the Autoimmune Protocol, which advocates avoiding nightshades, among other gut irritants, so I wanted to make a marinara sauce that could be enjoyed without the use of tomatoes, bell peppers, alcohol, or added sugars. 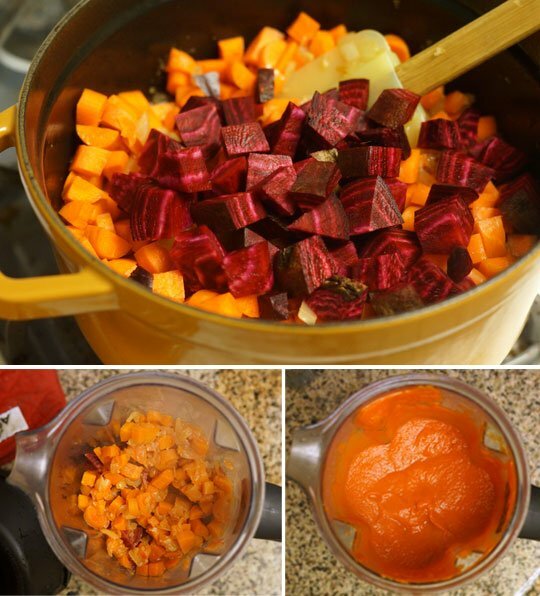 Made with a simple blend of carrots, onions, lemon, garlic, and a beet for its red hue, this sauce is as easy and healthy as it gets, and it is just as satisfying as traditional red sauce. I’m actually surprised by how much I like it! Whether you require a nightshade-free marinara sauce, or are just looking to change up a recipe in your weekly dinner rotation, I hope you enjoy this sauce as much as we have. Melt the coconut oil in a large pot over medium heat, and saute the onions until they are tender and golden, about 10 minutes. Add in the minced garlic and saute until fragrant, about 1 minute. Add in the carrots, beet, and water and bring the mixture to a boil. Cover and lower the heat to a simmer, cooking until the carrots and beets are fork-tender, about 30 to 40 minutes. Carefully transfer the mixture to a high-speed blender, add the salt and lemon juice, and blend until smooth. (Be sure to cover the vent in the lid of your blender with a dishtowel to prevent the top blowing off from the pressure of blending hot liquids!) Taste the sauce and adjust any seasonings, as needed, including a dash of oregano and basil, if you like! You can also add additional water, if you’d like a thinner sauce. Serve warm over your favorite vegetable or pasta dish, and enjoy! Leftover sauce can be stored in a sealed container in the fridge for up to a week, or in the freezer for months. 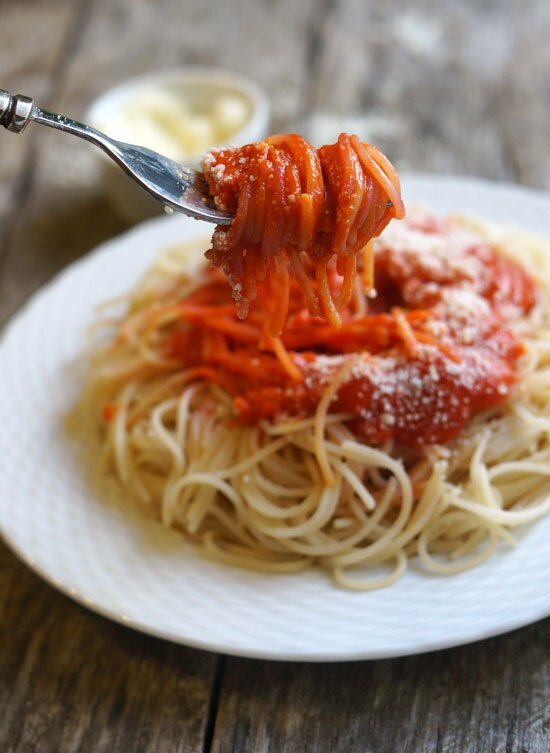 A quick and healthy marinara sauce that is free of nightshades, sugar, and alcohol. Carefully transfer the mixture to a high-speed blender, add the salt and lemon juice, and blend until smooth. (Be sure to cover the vent in the lid of your blender with a dishtowel to prevent the top blowing off from the pressure of blending hot liquids!) Taste the sauce and adjust any seasonings, as needed, including a dash of oregano and basil, if you like! You can also add additional water, if you'd like a thinner sauce. If you’d prefer to use apple cider vinegar instead of the lemon juice for tartness, I’d start with just half the amount called for, as I find the vinegar more potent in flavor. As always, please leave a comment below letting us know any other substitutions you try! Reader Feedback: Have you ever tried eliminating nightshades? 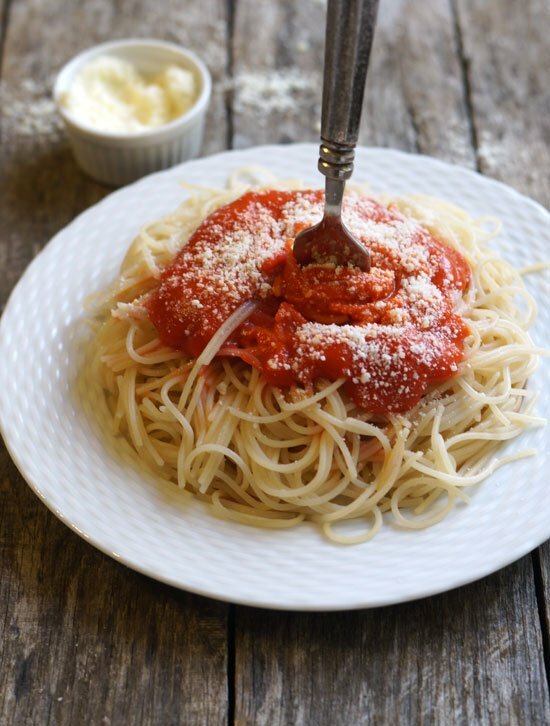 Do you have a favorite alternative to classic marinara sauce? I’ve never tried eliminating nightshades myself, and I have a feeling it would be really difficult for me. I love pretty much everything on the nightshade list! Oh my. I made this and it’s delicious. I don’t think the kids will even know the difference. My hubbys tummy will thank me. I added lots of fresh basil and even kale and spinach. Yesssss. So excit d. Thank you sooo much. Could this recipe be used in other dishes besides Italian ones? For example, could I use this instead of tomato puree when making curries or enchilada sauce? Thank you so much for this recipe! We’ve tried another similar recipe in the past but it doesn’t even compare to this. My husband has a nightshade allergy and we were craving spaghetti and I stumbled upon your recipe. It is absolutely incredible, we made it last week and are making it again tonight! We ended up using canned beets and shredding the carrots in our food processor to make for easier/faster cooking, and adding some balsamic vinegar. Other than that we kept just as you wrote it. Excited to try this recipe! I want to make this for a family member, but they can’t do onions. Any suggestions for a substitute? Add more of something else? I will be saving this website to my favorites for sure! My jaw dropped when I saw this recipe. I get really sick if I eat tomatoes. I was sad, I was thinking no more spaghetti and meatballs or steak and chicken stew. I’am so amazed and thrilled with this recipe. I cant wait to try it. Thanks a million! Great recipe but in addition to the nightshade vegetables I cannot have onion or garlic. This allergy is killing me, literally. Everything has onion and garlic in it. Do you have any suggestions for substitutes of onion and garlic? It seems there’s a substitute for everything else but not these two super savory spices. Thanks for any suggestions, I’m desperate! I was having a lot of food sensitivities and was given the book “The Plant Paradox” and have been following that as well as I could and started getting foods back I need my diet. It’s probably your gut is so damaged food is making you sick. Try the diet and see if you get better. Took me a couple of months to get onion and garlic back and I can only eat them cooked but I went 2 years without until I started on this diet. Two months later I’m eating some normal foods again. Good luck. Hi- I can’t eat onions either, but I have found that I can tolerate the green tops of onions if cooked well in a recipe. That may be an option for you as well. I grow them in my garden and just harvest part of the tops from each bulb. New tops keep growing and so just a handful of onions lasts me all year. How well do you think this would hold up in a crock-pot if I were to make it for meatballs? We have really loved this recipe and I wanted to share that we’ve used it as a pizza sauce and now to make a nightshade-free chili that looks and tastes like regular chili! I’d love to share the chili recipe since I have been a bit disappointed in the other nightshade-free “chili” recipes out on the internet. Thanks for the great sauce! I think this recipe will continue to be a work horse in our kitchen! I’m so glad to hear that it’s working so well for you. Thanks for sharing!! Please share the chili recipe. Thank you! Please share your chili recipe. I made this tonight and it was great! I was hesitant because I really dislike beets, but was pleasantly surprised with the results. I used olive oil instead of coconut and added Italian herbs. In addition to the lemon juice, I also added apple cider vinegar to taste. I didn’t find that the lemon alone created enough acidity for the dish to mimic tomato. I added ground, grass fed beef to the sauce and served it over sweet potato starch noodles. I ate a modest potion and felt STUFFED – much fuller than I would feel with the same amount of marinara over wheat noodles. Very excited to try your delicious looking tomato free sauce fr my tomato loving intolerant family member so we may all enjoy Italian together. Thinking of also using it for beanless chili w a slight change in seasoning and ground turkey. I just made this today and I’m amazed how good and close to regular Marinera in taste and color it comes out to be. I adjusted the spices but it still came out great and I’m so pleased with the fact that it’s so healthy and easy?. Thank you for this recipe. Thank you so much, I became deathly allergic to tomatoes last year after 45 years of eating them and growing them , I have been lost …. alot of stuff have powder, paste, something tomato. I will try this and keep looking for more on here. Thank you- This could possibly be a life saver for us. Found out yesterday that my daughter has developed an allergy to tomatoes. There is a possibility eggplant also. I appreciate that you have taken the time to make this. I was going to experiment and decided to google first. Pizza is her first love and she was really thinking that she could eat just a little. I hope this works for her. She is definitely a headstrong teen. Michelle, how did the altered recipe go? I cannot have carrots (too much sugar) and was wanting to try that recipe. Thanks for the original post! Thank you for posting this My young son and i want to make this, but we are omitting the oil..do you foresee any problem with the end result and its incumbent taste? I am INCREDIBLY happy I came across this recipe! My dad is allergic to tomatoes (well not allergic, but he has extreme joint pain when he consumes them), and he’s been avoiding tomato ever since! I just made this and it’s delish! Served it with paleo turkey meatballs over zucchini pasta. Yum! Made this tonight with gluten-free pasta.. and I LOVED it. I’ll probably add more spices next time but the kids didn’t even notice a difference! Thank you so much for your creation! This will be a regular staple in our dinners! It’s similar to the ketchup my wife makes and this one tastes great. Not as messy as the ketchup recipe. Now to tackle mustard without paprika. Did you find a recipe for paprika-free mustard that tastes good? How about mayonnaise? So tasty! I like this better than the tomato version. I added a ton of garlic, onion, italian, oregano, and basil seasonings. I also used chicken broth in place of water, added ground turkey and topped with fresh parmesan. Holy yum! What a wonderful wife you are! I wish your husband all the best in his healing! My husband cannot have tomatoes or lemon (citrus). I wondered why the lemon is in the recipe. What does it do? What could I replace it with or would it work without the lemon? I appreciate any feedback. We are very excited to find this! Thank you! The lemon replaces the acidity that tomatoes usually give to marinara sauce. You could add a splash of vinegar instead, for a similar flavor. Oh rats – we can’t do vinegar either , because of the acidity. I’ll play around with it and see what I can do. I appreciate your response! Just wondering why you can’t do lemon? lemon while it is an acidic fruit actually becomes alkaline in the body when we injest it. just thought I’d share. Thank you Kristen for the insight. Simply going by what the doctor told us to avoid. There is a long list of foods to avoid for Interstitial Cystitis (IC) and “citrus fruits” is one of them. We will try it as soon as we can get his pain to go away. Right now he wouldn’t want to risk it. He’s at a 1-3 on the pain scale so we’re making improvements. Hoping it will just a take a bit for the body to heal. Heather, i have IC as well. I make a similar “no-mato” sauce that does not have any added acids and it comes out great. I roast the carrots, beets, and red bell pepper (they are not an issue for me) and add basil, oregano, and fennel. Other people I know with IC have used a little pear juice, but that does make it a bit sweeter. Heather, Buy your hubby some Prelief or put 1/4 tsp, of baking soda in the sauce to lower the acidity. Also check the ICDiet site. I have IC also. not fun. Thank you for this! We have been avoiding Tomato sauce and lemon juice with my 13 month old son b/c of them causing a facial rash. He has just decided to get picky on me and not being able to make him spaghetti is frustrating me! Just made it for dinner. Was really surprised at how good it tasted. In fact, the smell of it resembles a delicious, authentic bolagnaise sauce! I added oregano, parsley and time for extra flavour! I may be able to consume tomatoes but that won’t stop me from trying out this sauce! Looks amazing! I had just begun researching ‘no-mato’ sauce and since I love your blog I was thrilled to see you made this! I made it tonight, adding basil, oregano and lots of extra garlic (we love garlic!). It is so delicious!! Not exactly like tomato sauce (well there aren’t any tomatoes so….lol! ), but we LOVE it!! Using it in lasagna right now. Thank you so much! I think I will try it with with some nutritional yeast and vegan parmesan. If you’re not vegan you might try and add a parmesan rind while the sauce simmers. Also, the longer you let a marinara simmer, the more the flavors will permeate. When I made traditional marinaras, I’d put a small handful of basil, a tablespoon of dried oregano, maybe a teaspoon each or so of dried thyme, dried rosemary, dried marjoram and dried fennel, salt and pepper to taste, and let a parmesan rind simmer in the pot. I’d add more freshly grated parmesan at the end. You can also add some crushed red pepper flakes if you can tolerate a little spice. Hopefully that’ll help! Thank you for this recipe, my son has many intolerances including nightshades and I really do struggle cooking for him sometimes. I made this dish last night, and used balsamic instead of lemon. My son loved it. Will definitely be cooking this again. This looks great! Any recommendations on a substitute for the beets? More carrots? I realize this would make it less sweet but beets are a big no. Yes, I’d just replace the beet with more carrots. My SO went on a nightshade-free diet a few months ago to treat his psoriasis, and it seems to have been helping his symptoms. I’ve found the exclusion of the nightshades from my cooking to be REALLY frustrating at times (tomato products and potatoes are just SO good — and USEFUL — in so many dishes! ), and I was JUST lamenting about needing to come up with a tomato-free pasta sauce. Now I don’t have to! In your pics, the sauce looks identical to tomato-based ones; amazing! I have given up most nightshades for the past 15 years. I do miss the occasional tomato on a sandwich out (I usually substitute cucumber slices), jalapenos in my queso, or baked potato slathered with butter from time to time. As you can see I’m not that strict with some of the things ppl are avoiding around this blog. Moderation works for me. So I love this recipe for giving some variety. I don’t notice any ill effects from these rare lapses, probably because they are maybe 1x month. I gave up nightshades, not for autoimmune challenges, but because I follow the Blood Type diet and these are avoided by Type As (and some for Bs). I will say, that when I eat multiple non-A foods at a meal, or in a day, I have noticed symptoms around my small intestine meridian (ex. tops of shoulders next to my neck)–horrible spasms. It was explained to me that there is an immune response happening in my small intestine when the non-blood type food gets absorbed into the bloodstream. The molecules are attacked as “not similar enough to become part of me.” When this chronically happens (like at every meal), then the small intestine meridian becomes too stimulated; it runs alongside the neck at the shoulders. That’s the way I understand it happens for me anyway. This has happened consistently enough that I don’t doubt it at this point. Ppl might want to check it out and see if it helps. I found I didn’t notice much symptoms except this and fatigue after non-type meals, and only after being pretty strict with it for at least a month. http://www.4yourtype.com It has the food lists for each type there. The books are best for the full explanations of the theory. I cooked dinner for a special group of my coaching clients 2 weeks ago, and 3 out of 10 had noticed a sensitivity to nightshades! Awesome recipe, I’ll definitely try this! Thank you for this! My mother and I both cannot eat nightshades, I cannot wait to try this!! Oh my gosh! My sister linked me to this post because I can’t eat nightshades…they irritate my gut & give me eczema! I cut them out of my diet nearly 2 years ago. 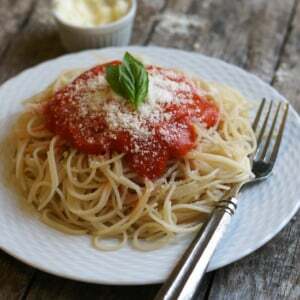 I can’t wait to try out this recipe as I miss having a marinara sauce! My husband has lupus and tried giving up night shades for awhile and didn’t notice any difference. We too were happy about that since we like a lot of those foods. He has improved giving up gluten, dairy, and refined sugar (oddly easier than the night shades) I would still like to try this recipe though since tomatoes are going out of season here and carrots, beets, and onions are about to be in abundance! Great seasonally minded recipe, especially over spaghetti squash! Oh em gee the nutrition nerd in me is squealing with delight with this post!!! Love everything about this and how incredibly tasty this looks. Amazing! Love your substitutions and alternative recipes, especially that they look the same as “the real thing”. Thanks for the recipe! Yahoo! We just started eating paleo and found out that my son has nightshades sensitivities so this is a God-send! I cannot wait to try it! Hi Suzanne! I also realized some years back I had joint pain everytime I ate nightshades. I drank tea made from burdock root for approximately 6 months and I no longer have sensitivity to nightshades or tropical fruits! It’s been amazing. I encourage anyone with these sensitivities to give burdock root a try. Wow, this looks like the real thing! What a great recipe for those with allergies. 🙂 I’ll definitely be checking into that produce box as well, that sounds like a great deal! Thank you! I have been hunting for night shade free, SIBO friendly (the onions are not so great,but can work around them) recipes. It seems paleo and grain free diets rely heavily on the nightshade family as well as eggs – which I also can not eat. Do you have any information on spinach, strawberries and bananas – I can’t eat any of those either. It is great not to feel so isolated as a foodie who has such a limited repertoire. I am so thankful for your website, great find! My mom had sibo, and a naturopathic doctor cured her and her food allergies with rifaximin for several months. Anyways, I love this recipe idea! I’m going to use golden beets instead of carrots, olive oil instead of butter, rice vinegar instead of lemon, and add basil! I’ll report back if I remember to. This post is so timely for me. I just met with a nutritionist and we discussed the very real possiblity/probability that I can no longer eat foods in the nightshade family because I feel so ill afterwards. Ugh. Unfortunately, I cannot offer any suggestions for recipes because this revelation is new. Thank you for sharing this recipe! I had no idea that nightshade sensitivity was even an issue! Thanks for posting. I definitely know some people to share this post with. Although, don’t think I could give them up myself…..love all those veggies on the list. Confession time, I love making the Olive Garden sauce that I found somewhere on Pinterest, it’s the real deal, tastes almost identical to theirs, alot cheaper and instead of pasta, I can use spaghetti squash. All winners here. I have been nightshade sensitive since i had a very obvious issue with eggplant in my early 20’s. I managed to make it through the next decade in almost complete denial (I euphemistically called potatoes ‘indigestibles’ for many of those years)because I didn’t know what was wrong.Now, although I do miss some things, I accept that this is just the way it is and my partner helps me monitor my diet. The elimination of nightshade has made a huge difference. It is recipes like this that help me get over cravings and explore other, better options (like nightshade free chili OMG). Also, I don’t wake up looking like Elvis anymore. I don’t consider it sweet tasting! The salt and lemon juice tone down the sweetness you’d expect from carrots and beets – my whole family thinks it just tastes like regular marinara sauce.